Hanoi (VNA) - The Vietnam Association of Seafood Exporters and Producers (VASEP) said that it is preparing documents to sue the US Department of Commerce (DOC) over its final conclusion in the 10th administrative review (POR10) of anti-dumping duties on shrimp products imported from Vietnam. According to regulations, Vietnam has the right to submit a file to the US International Commerce Court within 30 days. VASEP said Vietnam does not dump shrimp in the US, so it will sue the DOC to ask for the tariff to be brought back to the zero level. 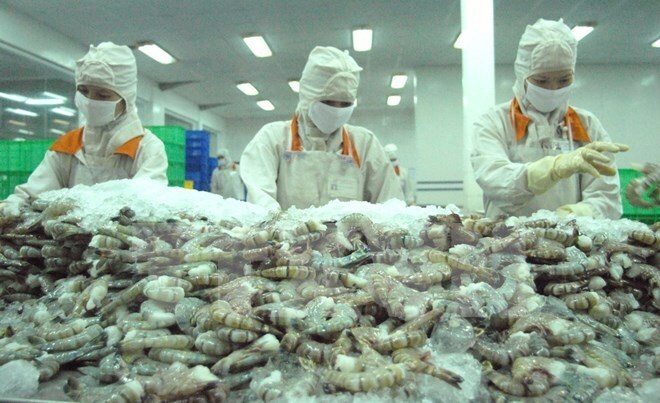 According to the Vietnam Competition Authority (VCA) under the Ministry of Industry and Trade, POR10 was applied to frozen shrimp shipments imported into the US from February 1, 2014, to January 31, 2015. Voluntary respondents are subject to an anti-dumping duty rate of 4.78 percent while the tariff imposed on other Vietnamese firms or exporters remains at 25.76 percent. It added that the United States had significantly increased the duty rate for Vietnamese shrimp in the POR10, from 0.91 percent in the POR9 to 4.78 percent at present. The main reason for the significant increase is the DOC’s continued application of differential pricing, allowing it reuse the zeroing method to calculate the dumping margins.